Grow an attractive and productive flower, herb or vegetable garden right outside your door! Generously sized and ultra-durable, this elevated bed is easy to tend, and keeps plants out of the reach of hungry rabbits and curious cats. 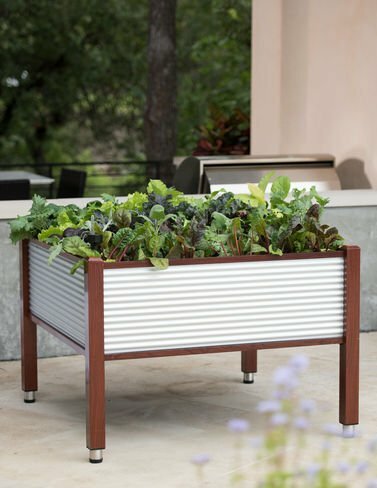 The galvanized sides and faux wood finish on the aluminum trim gives it a modern edge. The patented self-watering system uses capillary tubes to deliver water from the reservoir to the soil to keep roots consistently moist - vital for the healthiest and most productive plants. Grow an attractive and productive flower, herb or vegetable garden right outside your door! Generously sized and ultra-durable, this elevated bed is easy to tend, and keeps plants out of the reach of hungry rabbits and curious cats.